On Sunday night I trekked out into the wilds of South London to catch the UK premiere of Matthew Buzzell's film document of Luna's farewell tour. 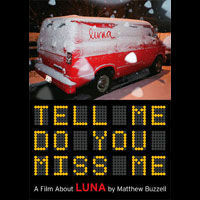 The film, Tell Me Do You Miss Me, was first seen in 2006 at the Tribeca Film Festival and was released on DVD shortly after, but had never had a big screen airing in the UK until Sunday night. The viewing was hosted by The Dream Machine and took place in the lovely Victorian pub The Half Moon in Herne Hill. The weather (and I suspect the location's rather tricky transport links) meant that the audience numbered probably only about 40 or 50 souls who settled down to watch Luna's last months. I've seen the film already a number of times on DVD but this was my first time watching it with other people. Hearing the laughs and the whispers and being among people who were watching a film rather than watching the demise of their favourite band made it a quite different experience. The film show was followed by a short set of Luna songs as performed by "The Dream Machine All-Stars" picking a nice mix of classics (Crazy People, 23 Minutes), covers (Season of the Witch, Indian Summer) and the obscure (It's Bringing You Down). All in all it made for an enjoyable evening only let down by waiting 20 minutes for a train and freezing my toes and fingers on the walk home.